Kristine Kathryn Rusch’s novel Diving Into The Wreck spawned a universe so vast that one novel can’t contain it. 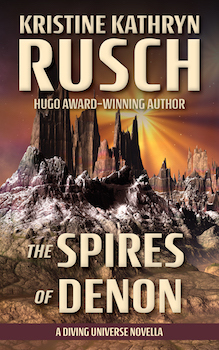 The Spires of Denon doesn’t involve Boss or her crew. Instead, this powerful short novel follows Meklos Verr, hired to guard an archeological dig near the mysterious Spires of Denon. There Verr encounters the prickly Gabrielle Reese who heads the dig, and he meets some cave divers who aren’t quite what they seem. Verr knows that someone wants to harm the dig, but he isn’t sure if the attack will come from outside the tall mountain range or from the group of archeologists within. Verr must figure out the threat before it destroys him, his crew, and the beautiful Spires of Denon.